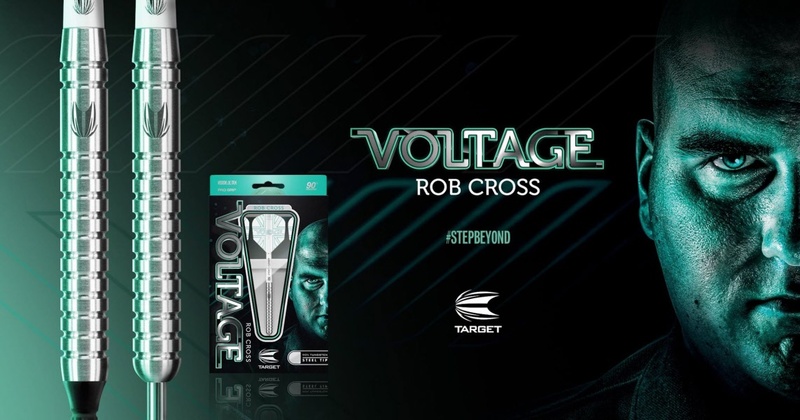 I've been looking for the perfect grippy dart for some time. Its no easy quest, especially as I watch MvG throw those aged barrles, Michael Smith throw his plain looking darts, Gary Anderson much the same. Lets not even get into Steven Bunting! Is a heavy grip really the right way to go? Well, for me I think it is. I had recently had the Harrows Sonics which I read in a review here were fairly grippy, but they still weren't quite what I wanted. I wanted to try the Pixel grip and I have a soft spot for Target, I'm not sure why, and I read these Azzurris are even grippier. So I decided to try these. They come in at 50mm long by 7.15mm wide. These aren't the bundled flights and shafts. They come with shorts, I use tweenies. My DSLR is home, so the pics are just cellphone quality, apologies again! The darts definitely have a premium feel and look. The pixel grip is something else. One thing that was part of my purchase decision, especially on these particularly compared to the AZ02s or 03s was the bump at the top of the barrel near the shaft. I like having a reference point for my finger there. In practice though, I must say I feel it a bit too much of a bump though and I wish it was a tad smaller, but thats a preference thing. Another thing, my previous 4 sets were all straight barrels, and I decided to try tapered ones this time. 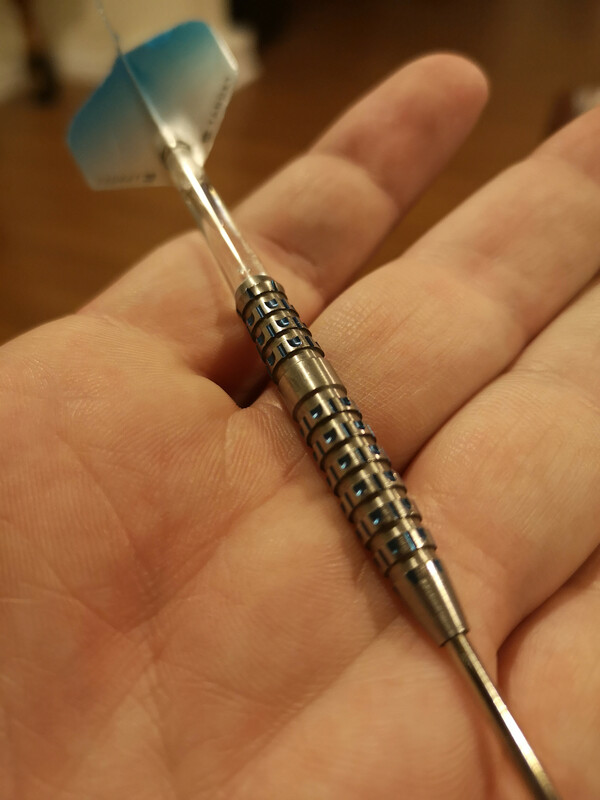 I dont have scales to weigh the darts, but I find the 24g to feel very weighty compared to the 22/23 I'm used to. I would have gone lower but the AZ01s only go down to 24g. 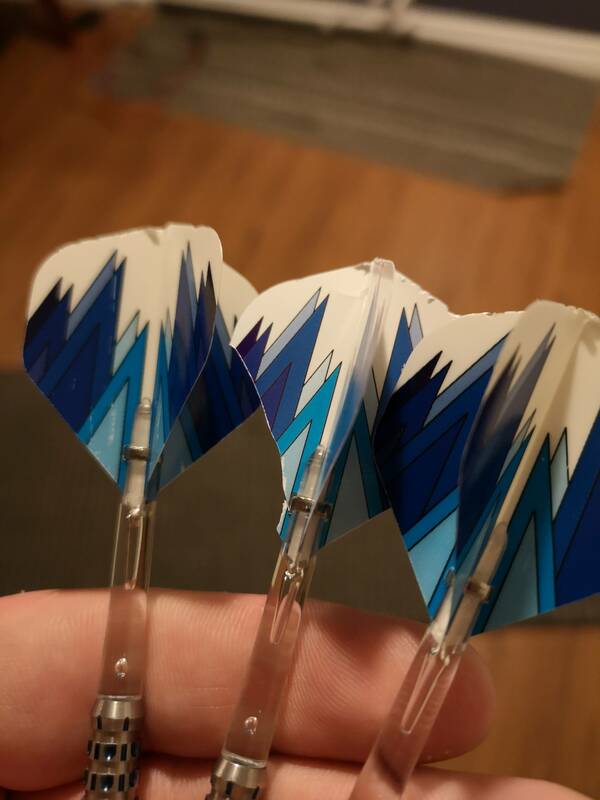 Ultimately there is only so much I can say about the dart that isn't influenced by my own preference and how I play. 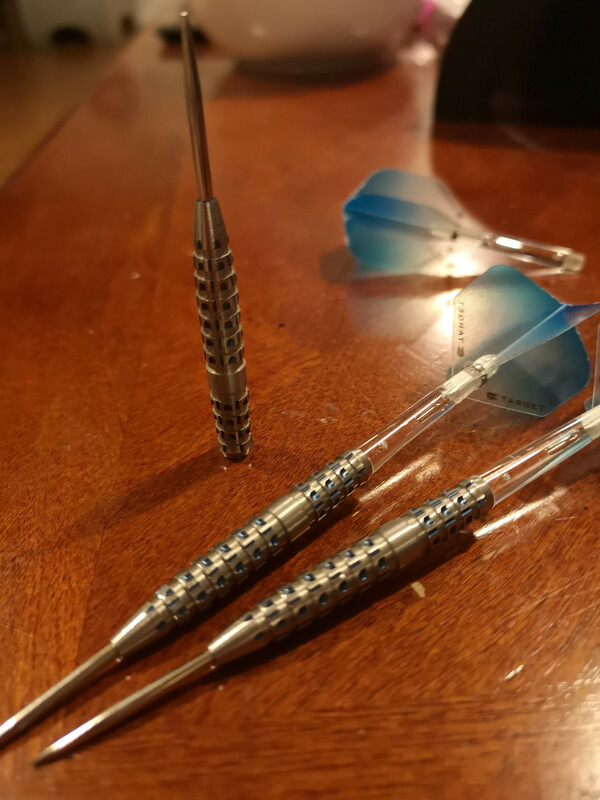 I am a rear gripper, but the grip is so strong throughout the barrel that no matter where you grip it you will be good, if you like a grippy dart. Nothing else I've held has home close. Take notice to the middle one there. How did that even happen? But keep this in mind, if you use these darts and can group with any regularity, be prepared to change them out often! I practice daily and I find myself changing flights two or three times a week now, if I was competing more often, so would be the regularity I put on new ones. That said, I dont think the barrels have banged up too much in the time I've had them, so thats good, as I was concerned about that in the beginning. I would expect the grip to last some time. I have to say I really enjoy these so far, I've played well but for me personally, they still aren't quite perfect. But I really cant complain as far as the grip goes, any issues I have now in my throw, I know the factor is only me. 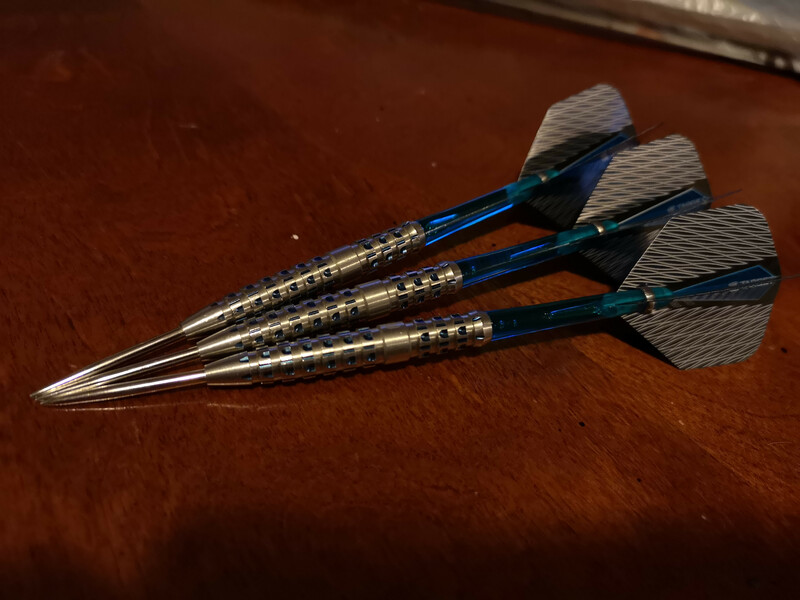 I really need to keep working on the consistency in how I grip the dart, and these having such good grip and reference points will only help with that. I still think I'm going to get those Daytona Fire GTs, maybe thats what I'll ask for for christmas this year. For the grip seeker though, these are definitely worth a try. 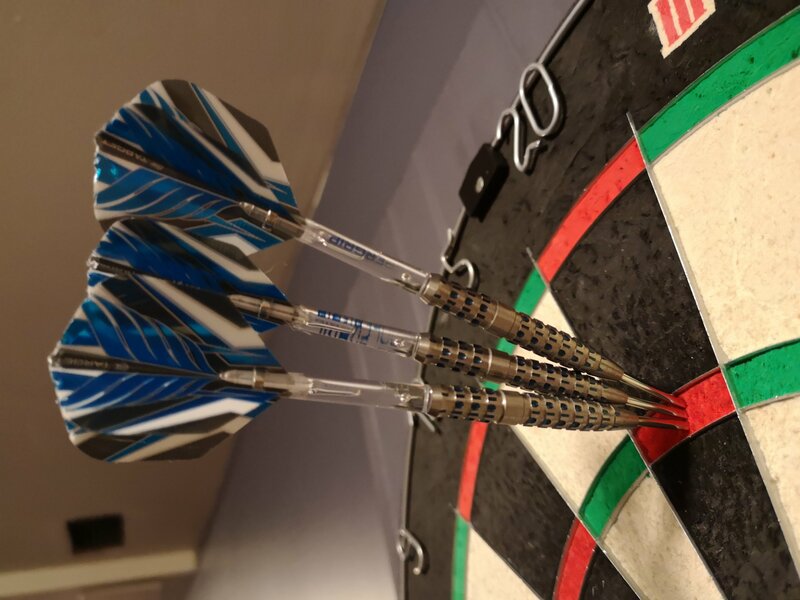 If your form is consistent, I think your darts will fly so as well with these. Nice review - I can only imagine the damage they would inflict on moulded flights. Are the points longer than normal? 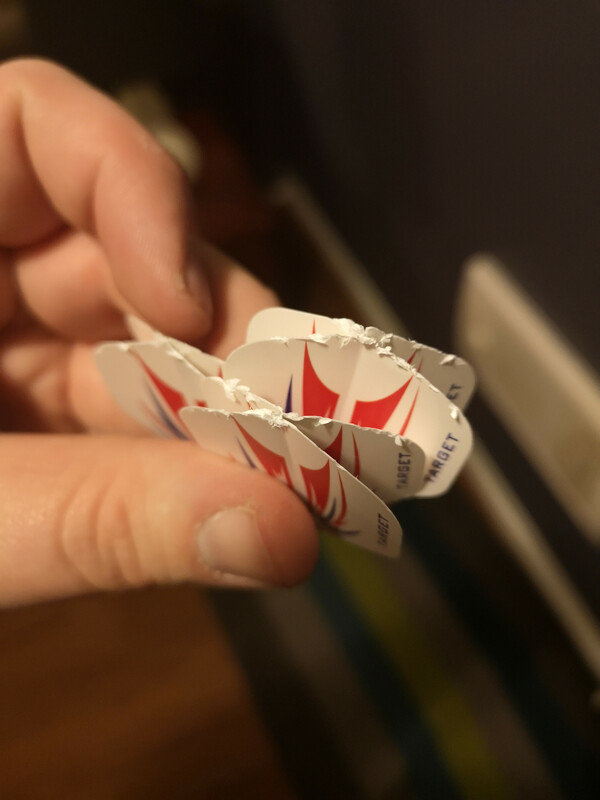 I notice my darts that have long points tend to catch flights more often and funnel them onto that sharp leading edge of the barrel. A Cheap Trident cone would fix that - shame they don't come in blue. Nice review and brilliant pictures. I love the mention of the trashed flights. 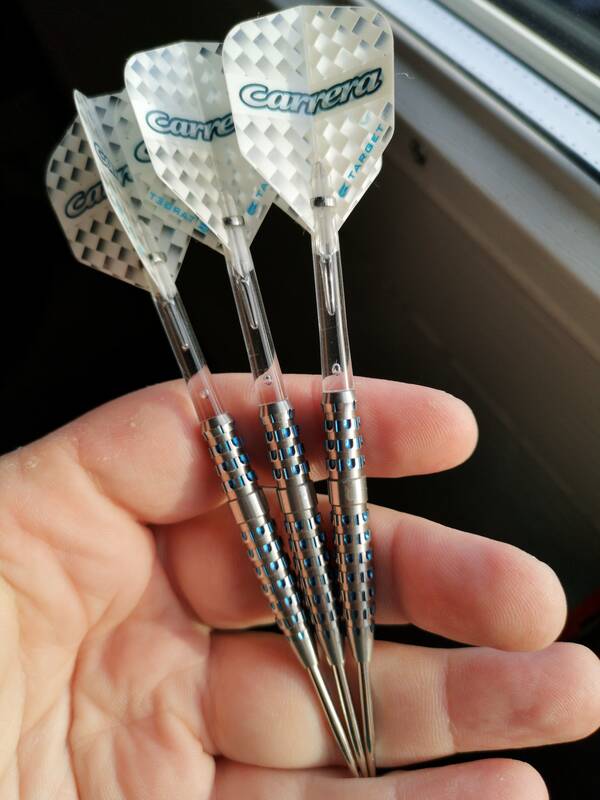 I put Silver Nano Grip points on my set of Azzurri Cortex CX2, very good darts. Can't see me ever throwing them again though. Beautiful pictures with that review. Boy-o...no amount of flight protector will help prevent such damage from grouping alone!